SBMA and Enterprise Singapore along with its host of sponsors and partners would like to thank the precious metals industry for its whole-hearted support towards successful conclusion of the inaugural 2nd edition of Asia Pacific Precious Metals Conference on 3-5 June 2018. The conference was attended by over 360 delegates from 170+ companies spread over 24 countries. Mark your dates for the 3rd edition of APPMC on 9-11 June 2019, Singapore. We welcome you to download the presentations, photos and view delegate list. Since Singapore lifted the Goods and Services Tax (GST) on Investment Precious Metals in 2012, the Singapore Bullion Market Association (SBMA) has been playing an active role in raising the profile of Asian bullion markets internationally. Over the next three years, the SBMA intends to play a greater role in the region by bringing together the bullion markets of the 10 ASEAN countries through the sharing of knowledge and best practices, liaison with governmental agencies and other relevant stakeholders in the region and beyond, and by connecting industry participants to global markets. 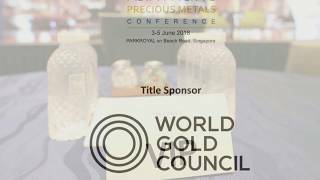 The Asia Pacific Precious Metals Conference (APPMC) is one such platform through which SBMA and Enterprise Singapore will work towards developing and strengthening a unified body in Southeast Asia for the bullion market.